I’m not really sure where the last month went. The last time I posted was before Dreamboys graduation. So…here’s a quick recap. And then there was the party! It rained most of the weekend, except for the four or five hours of the party. We waited til an hour before the party started to decide whether to put tables outside or in the basement. The sun came out and we had a gorgeous afternoon. Let me just tell you about the food. We didn’t get too crazy. Dreamboy wanted brats and broccoli raisin salad. We threw in chips and a thai pasta salad as well. But the highlight were these! Chocolate cupcakes filled with peanut butter mousse and chocolate ganache frosting and white cupcakes with strawberry filling and buttercreme frosting. If you’re local and need info, call me!!! They were fabulous! And a picture of the fam before the party started. Even The Genius came home for the weekend! I’m not sure what happened to the month of June. I was just going to sit around and knit, make meals, and do laundry. The sit around and knit part hasn’t happened a whole lot! My Hero and I had comprehensive physicals that led to more tests for me, which turned out to be nothing. That’s good, but I sure wasted lots of time figuring it out! Kids had dentist appointments and eye appointments. I was handed a decorating project which was supposed to be just a little carpet and paint. Ha!!! Ms In Charge had three weeks of drivers ed. Now she wants to drive. All. The. Time. Frankie visited Grandpa and Grandma. When he’s home, he mows lots of lawns. Superblonde is working on a couple of college classes. She really hates math! Dreamboy is working with Dad and Uncle. The Genius is back at work, fighting for justice. This week, a lot of my family is around, so we’re going to just hang out and enjoy all that chaos! And, yes. I’m knitting. And spinning. But right now I’m going to go make two huge pans of chicken enchiladas for dinner tonight! Categories: Uncategorized | Tags: cupcakes, family, graduation | Permalink. Well, we have one family photo, but its not what I was imagining, so we will keep trying. While I’m waiting, I knit. Gee!!! There’s a surprise. 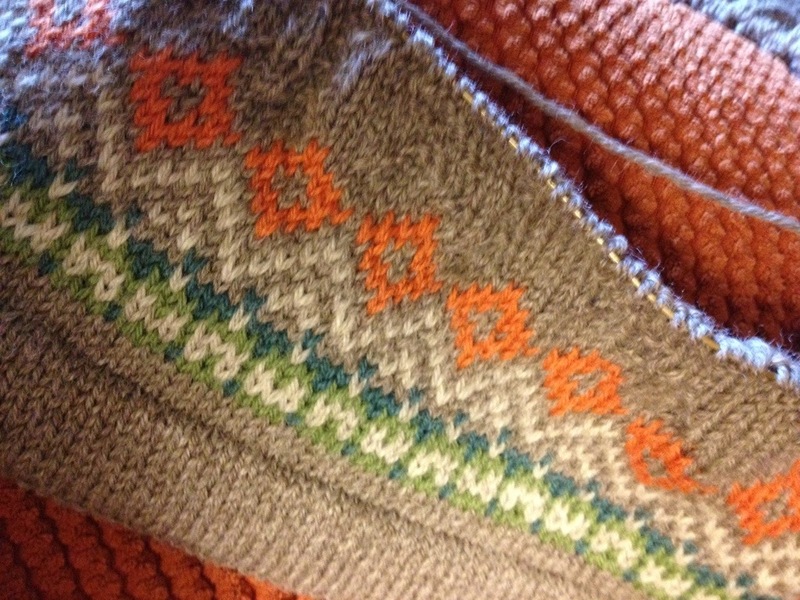 I started a new Dale of Norway sweater for My Hero. I won’t knit it in 16 days like I did the last one though. It probably won’t be his favorite either because the colors aren’t traditional Dale. Gotta go! Evidently there is stuff to do here in not-sunny California. Actually, the weather was gorgeous yesterday. I’m not complaining. Categories: Uncategorized | Tags: Dale of Norway, family, knitting | Permalink. Frankie is one happy guy. He finally has his sock monkey quilt on his bed! Frankie said he slept great last night!!! Categories: Uncategorized | Tags: family, Quilting | Permalink.